In order to ensure highest standards for our products and services, PEPperPRINT is certified for ISO 9001:2015, which sets out the criteria for a quality management system. ISO 9001:2015 has a strong customer focus, structures business and production processes, determines quality control steps and also includes continuous improvements. PEPperPRINT performs annual internal and external audits to validate its quality management system and to maintain ISO 9001:2015 standards. Throughout frequent customer contacts and additional customer satisfactory surveys, we constantly strive to improve our products and services according to our customer’s needs. A variety of testimonials proves our active engagement to high customer satistfaction. The amino acid toners are routinely analyzed by HPLC to verify the integrity of the embedded amino acids. The surface loading of glass slides used for microarray production is determined by UV/VIS spectroscopy after cleavage of the Fmoc protection group. Our custom glass slide coatings are routinely analyzed with respect to chemical composition by XPS, and film thicknesses as well as homogeneities by ellipsometry. Contact angle measurements are regarded as insufficient QC average for thin-film characterization. 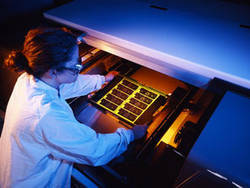 Printer calibration and microarray identification in line with the production is enabled by engraved data matrices and register marks. Each print-out is visually inspected with regard to printing homogeneity, toner loading and possible misprint. We routinely run double coupling steps to get as close as possible to quantitative coupling yields. After coupling, non-reacted amino groups are capped to avoid the formation of deletion peptides. All coupling and coating steps are processed under controlled inert gas atmosphere. According to HPLC analysis and mass spectrometry, side reactions like aspartimide and β-lactam formation or racemization can be excluded. All washing, capping and deprotection steps are carried out automatically by a custom software- and sensor-controlled synthesizer. Up to 160 peptide microarrays are produced within a single batch ensuring highest chip-to-chip and on-chip reproducibility. Before usage or shipment, each microarray batch is analyzed by control assays with a peptide microarray of well-selected FLAG/HA permutations stained by anti-FLAG and anti-HA antibodies. The assay provides detailed insight on coupling and printing performance of all amino acid toners and would unambiguously highlight any quality issues regarding amino acid integrity and printing performance. If you want to learn more about our QC standards for peptide microarray production, please don't hesitate to get in touch with us, and to discuss your questions and inquiries with our technical support.